﻿Last week, a public meeting was held by MTA on the future of the Purple Line and the accompanying trail improvements to the Capital Crescent Trail that would make the portion of the trail between Bethesda and Silver Spring a more viable connection between these two employment and transit hubs. 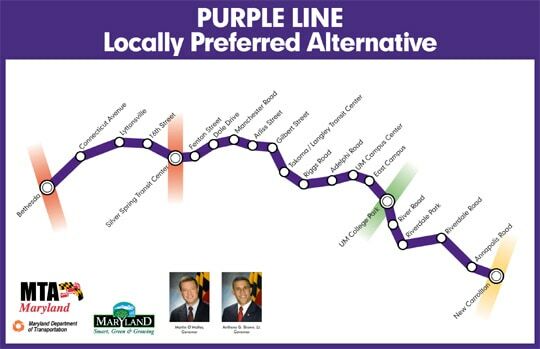 After more than a decade of debate, you might think that questions about the future Purple Line would be put to rest. But as work has continued, budgets have tightened, and cost estimates have been released, some trail opponents are bringing up the same misleading arguments about lack of public input, expense, and harm to the Capital Crescent Trail (CCT). Throughout this planning process, trail opponents have cloaked their opposition with positive spin, naming the anti-Purple Line advocacy organization “Friends of the Capital Crescent Trail” and circulating a “Save the Trail” petition. This has created a great deal of confusion, and we want to clarify—now that some time has passed—where WABA—as credible, regional cycling advocates who love the trail and have advocated for it from its inception—stand on this project. So let’s set the record straight: The Purple Line is not going to destroy the trail. While the trail will change, in most ways it will be for the better. The fact is that the Purple Line is the best way— in fact, the only realistic way—to get improvements to the existing segments of the CCT and to extend the trail into downtown Silver Spring. WABA has studied the arguments of Purple Line opponents about the impact of a transit line running parallel to—and in the same right-of-way with— the Capital Crescent Trail with great interest. We have considered their claims carefully, and we think they are simply incorrect. The Purple Line build options in the environmental impact statement are fully consistent with preserving the trail . . . . WABA prefers the light rail versions to the bus line options because rail would more effectively integrate the area’s transportation infrastructure, including Metrorail and alternative modes of commuting such as bicycling. The existing trail includes at-grade crossings with limited visibility or heavy automobile traffic at Jones Bridge Road and Connecticut Avenue . . . . Once the trail reaches the western part of Silver Spring, cyclists and walkers are dumped onto the streets, and they are forced to cross wide, busy intersections at 16th Street and at Colesville Road. The heavier investment Purple Line options provide for the trail to cross all of these intersections on bridges or under tunnels, improving safety. Montgomery County and MTA planners have adopted each and every one of the specific recommendations we made in 2008. At a briefing for the board of the Coalition for the Capital Crescent Trail, MTA showed how the trail will be extended by an additional 1.4 miles into downtown Silver Spring as part of the Purple Line project. The CCT will connect directly to the future Metropolitan Branch Trail in the new Silver Spring Transit Center, as WABA requested, to complete the missing northern link in the long-planned “bicycle beltway” beginning at Union Station, extending north to Silver Spring, west to Bethesda, and south again through the District of Columbia ending in Georgetown. The rebuilt trail will be more complete, wider, better paved, and better separated from motor vehicle traffic than the interim gravel trail that exists today. As WABA recommended, the trail will be paved and 12’ wide from the Bethesda tunnel to Silver Spring. The trail will have grade separated crossings of all busy highways, including Connecticut Avenue, Jones Mill Road, 16th Street, Spring Street, and Colesville Road. The trail will be safely separated from the transit tracks by a landscaped buffer and fencing, and it will include direct access to five transit stations, including at the Bethesda and Silver Spring Metro stations. Now, will these improvements come without investment? Of course not. But the more recent release of a $65M cost estimate for completing the trail has brought trail opponents back into the picture.So let’s put that $65M in context. Certainly, we could demonstrate that much of the cost allocated to the trail is actually for access to the rail stations that would exist, regardless of the trail’s status. And we could argue that certain costs for moving the existing trail were computed in a way that is never applied to similar relocations of roadways. But even if we accept the $65M, we can still show that, as a transportation investment, this trail is good buy. Yes, $65M is a lot of money. In the context of our own personal or family economies, it is overwhelming—and that is why opponents of the trail are citing it. It is a big number, and that is all they want people to hear, even if that big number represents a good investment in transportation infrastructure. So let’s take that $65M and place it in the cost context of transportation infrastructure. Looking at current projects in Montgomery County, a standard resurfacing of existing roadway is slated to cost $3.5M for a 1.4 mile stretch of roadway—with little to no change in transportation effectiveness. (Resurfacing University Blvd. from Arcola Ave. to Colesville Rd.) And improving a single roadway intersection is budgeted to cost $62.5M—nearly as much as the entire trail, even accepting the $65M figure. (Georgia Ave. at Randolph Rd.) And that’s not even comparing it to the truly expensive projects, such as the $2.5 BILLION Intercounty Connector, whose affiliated bicycle-related projects to serve east-west traffic already have been undermined. So here is the bottom line: Yes: $65M is a big number when compared to a weekly grocery budget. But it’s not a big number when compared to the massive costs accepted simply as necessary to move cars around our region. And here, we know that this trail is a better investment in moving people because we already know that the paved portion of the CCT moves over a million people every year from DC to Bethesda, but experiences a significant drop-off in usage when it leaves Bethesda and becomes unpaved. WABA looked at the Purple Line years ago and concluded that the rail option was the best thing for cyclists, and for the region’s mobility. Looking at it again—in the context of regional growth, the progress in Silver Spring, and the ongoing work on the Metropolitan Branch Trail—we are even more convinced of that conclusion today. We know Silver Spring is growing. We know Bethesda is growing. And we know that regionally, Silver Spring is to become a major multi-modal transportation hub. Completing the Purple Line and accompanying trail continues to be the best and most effective opportunity to contribute significantly to the regional trail network in Montgomery County, and to enable people to travel by bicycle. As mentioned yesterday, WABA will be at the Bethesda CCT trailhead and along the trail providing safety tips, route guidance, and other information to cyclists. If you have questions about the trail or the impact of the Purple Line, we would be happy to answer them. Look for us from 10am to 2pm. Note: This posting is adapted from an article in the forthcoming issue of RideOn–WABA’s quarterly newsletter for members. Thanks to Casey Anderson and Wayne Phyillaier for their contributions to the article and for their ongoing advocacy in support of the trail. Topics: Uncategorized. Tags: advocacy, CCT, Maryland, Montgomery County, news, Purple Line.